INA roller chain idler sprocket units are guidance and return units for roller bush chains and roller chains. They can compensate for chain stretch resulting from operation and provide smoother system running under high loads and speeds. The ready-to-fit units comprise sprockets and deep groove ball bearings. 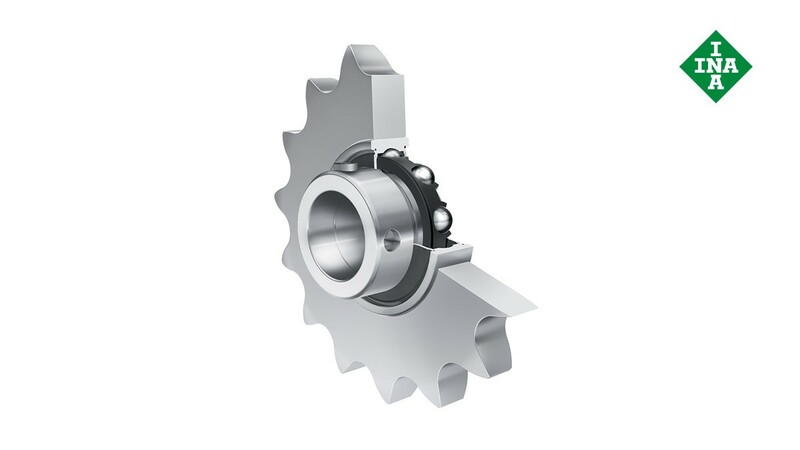 The sprockets are made from high-strength steel, sintered iron or plastic (polyamide). Sprockets made from plastic offer particularly smooth running and generate very little noise. Since the inner ring of the deep groove ball bearing is extended on both sides, no additional spacer rings are required. In series KSR..B0, the inner ring is located on the shaft by means of a locking collar. The bearing bore of this series has a plus tolerance. As a result, unmachined shafts up to ISO tolerance h9 can be used under moderate loads and speeds.